Every day in Winsted and its surrounding towns, The Salvation Army helps bind the wounds of modern-day life, offering food to the hungry, shelter to the homeless, and companionship to the forlorn. As long as people are discouraged, lonely, or needing a helping hand, our “Army of Compassion” continues to have a mission. 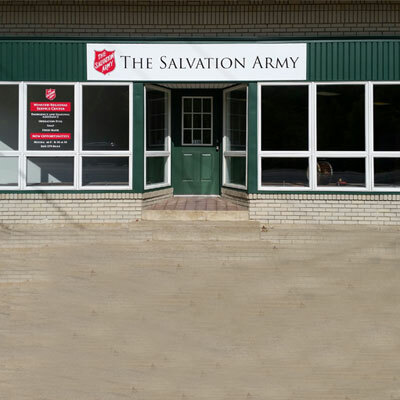 In response to the need for a centralized social service resource center in Winsted, The Salvation Army has committed to a full-time center staffed with a Regional Volunteer Coordinator/Site Manager. This individual will oversee all Winsted activities as well as towns and villages in the greater Northwest Corner. Our dedicated staff and volunteers will continue to touch lives through selfless acts of service. Our mission could not continue without the support of our communities. Donations support our services; volunteers enable us to do more with less; partnerships allow us to fulfill our mission of serving others. You will make a major difference in our ability to serve others through this expanded resource center. Monetary and non-perishable food items are gratefully accepted at this location. New Toys and Back To School Supplies are seasonal; please call the center for details. Clothing is not accepted at this location. The Center is immediately available to people in Winsted, Colebrook, Norfolk and their villages, providing Comprehensive Emergency Assistance and access to the Food Pantry and Personal Hygiene Closet. Text WINSTED to 71777 or click the Red Kettle Below!